One year ago today Hubs got down on that not-too-shabby knee of his and popped the question. Do you want to know what this question was? Yes, yes, I believe that was the question. 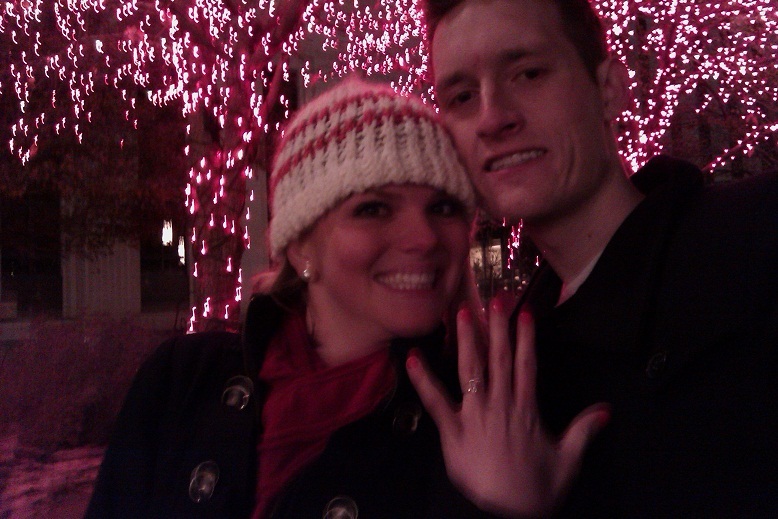 Like any good Mormon boy at Christmas time, Hubs proposed at Temple Square. The entire day he was acting weird. I'm no detective, but I could tell something was up. It was a Saturday and we were spending the day up at Hubs' parents house. There were a few irregularities that day... like Hubs sneaking into a room with his dad to discuss something... or that Hubs' dad had gone to Provo and when I asked why, I got different reasons from Hubs and from his mom. Still, Hubs had covered his evidence nicely. We had already picked out the ring together and Hubs had apologized to me the day before, saying the ring was taking longer than he thought and he wouldn't have it until after Christmas. Like a fool, I believed him. Hubs said he wanted to go on a date to see the lights at temple square since we hadn't gone yet. I said okay. An hour before we were going to head out, Hubs was pouring himself a cherry coke. Me and Hubs' mom had ourselves a good laugh when he absent-mindedly kept pouring, even after the glass was filled. The cherry coke spilled all over the counter top. "I think he's distracted, don't you?" said Hubs' mom with a twinkle in her eye. 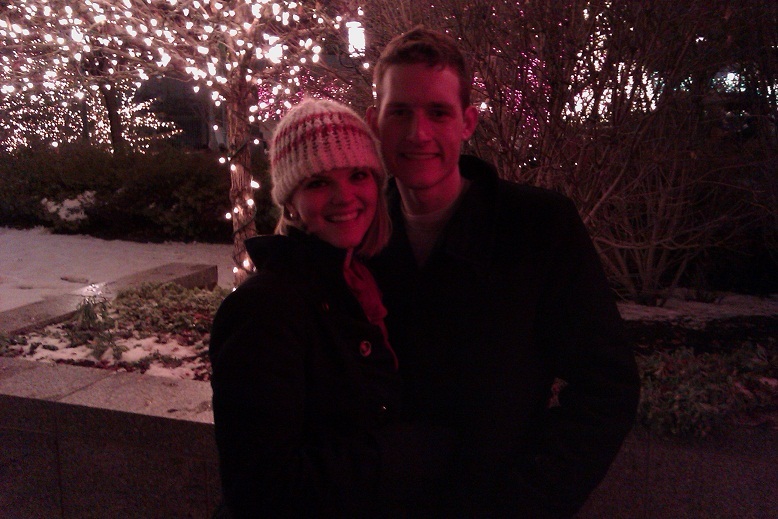 We set out that night for our date to Temple Square. To my dismay, I discovered I was having a lady emergency of sorts. I made Hubs stop at Smith's to get some lady items. For the rest of my life, I'll remember that an hour before Hubs proposed I made him run in and get feminine products for me. We got to Temple Square and walked around. And walked. And walked. I had suspected that Hubs would propose, but here we were just walking around, twiddling our thumbs, and he certainly didn't seem about to pop any important question. I even looked closely at his pants pockets. No lump there. With a sigh of disappointment, I finally decided that tonight would not be the night. Then Hubs took me over to a little removed spot- away from all the hustle and bustle. There was a beautiful big tree behind us, and no one around anywhere. 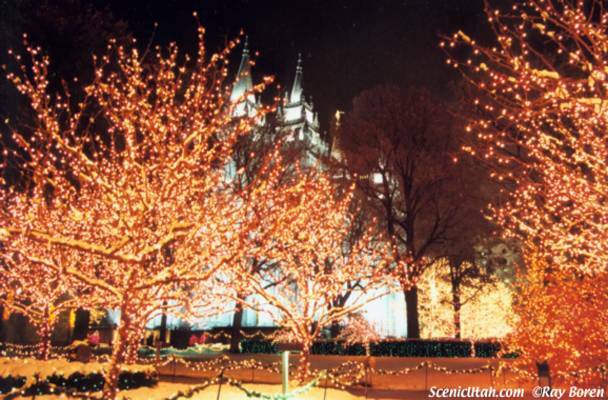 Hubs turned me around and put his arms around my waist and we both stood there, staring at the Salt Lake Temple. My ears were perked, listening oh so carefully to any unusual sounds. Was this to be the moment? Hubs moved his hand up to his jacket. Hubs cursed under his breath. That stubborn ring box had gotten caught on Hubs' jacket! I knew what it was immediately, of course. But suddenly I was nervous. Oh so very nervous. Sweaty-hands-and-I'm-going-to-wet-my-pants nervous. I couldn't turn around for fear. I heard Hubs behind me, "Bon...."
"Hm?" I played dumb. I was panicking. What do I do? What do I say? Do I cry? Do I smile? Nobody ever tells the girl what to do in this situation. Hubs tried to get me to turn around. "Bonnie?" I stayed looking forward. He turned my waist. I wouldn't budge. Finally, he pushed hard enough to succeed in getting my body turned around. Dropped down on that not-so-shabby knee of his in record time. Suddenly I wasn't worried about what to do anymore. I didn't care if I laughed or cried or screamed or whispered. It all felt so natural...like I had been practicing for this all my life. "YES!" I exclaimed. He put the ring on my finger and picked me up and kissed me and hugged me and we laughed and laughed and laughed. No crying on the proposal day, just a lot of laughing. Hubs had his phone, so we managed to take a few poor quality pictures with it, committed ourselves to never forgetting this day, and then sprinted to the car to get out of the cold. Not even an incredibly romantic proposal can stop the cold, afterall. We laughed all the way to the car. We ran, laughed, looked at each other, laughed, kissed, ran, laughed, "Can you believe it? 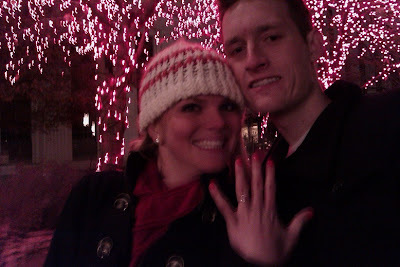 We're engaged!!!" And laughed some more. There is a lot of stuff that I am thankful for to Hubs. He does so many things for me every day, and I am constantly trying to remember to thank him for it all. Thank you for taking out the trash. Thank you for going to two huge family Christmas parties in one day. Thank you for the back massage. Thank you for asking me to marry you. 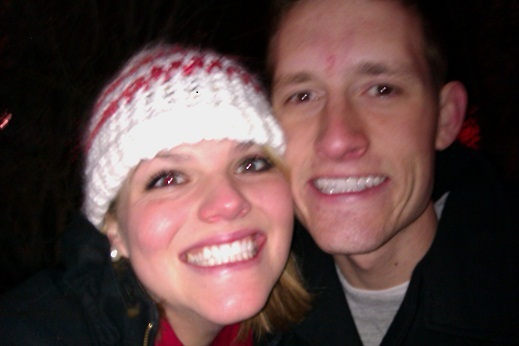 The night after our engagement. We are all smiles.